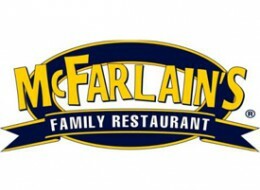 McFarlain's Family Restaurant brings to you the culinary history of the Ozarks with traditional Ozarks cooking and recipes that have been handed down from generation to generation. So when your here in Branson stop in for a visit and enjoy a true Ozark meal and our warm hospitality. THIS VOUCHER HAS NO CASH VALUE & EXPIRES 12/31/16. Any unused portion of voucher is non-refundable. Not valid with any other offer, discount, promotion, coupon and/or purchase of alcoholic beverages or merchandise. Gratuity not included. Availability at property not guaranteed and is subject to change without notice. Vouchers are not replaceable if lost, stolen, destroyed or expired. Tax related to contents of meal voucher included. No credits, refunds, rain checks provided.